Comics In 5 Panels: Johns-Month(and a half): JSA. What can I really say about JSA that haven't been said already? It's one of the greatest comic book series of our time, about the very first super-team. The Justice Society(or JSA for short) members are a mix of some of the first superheroes(like the Golden Age Flash, Hawkman and Wildcat), as well as their heirs. JSA is possibly one of the greatest successes in the comic industry. 4/5 of all comic fans know this legendary series. It has millions of positive reviews, brilliant writing, unforgettable characters and trilling stories. So, what can I possibly say about this groundbreaking book, that haven't been said yet? ... How about everything WRONG with JSA? Oh yeah, I'm going there! All comics, no mater how brilliant they are, has their faults. JSA is no exception. So I will tell you what I think is less than great about the book, and I would love to hear if you agree/disagree with me. And it's not a top 3 or something, so number 1 is not the worst, it's just first. Oh, and spoiler alert... But seriously, if you haven't read this magnificent series yet, then GO!!! GET IT!!! I highly recommend that you start with Vol. 1 "Justice Be Done," since this is one of those series that's kinda hard to follow if you just jump into the middle of it. It's possible, but not problem-free. Problem number 1; Black Adam. It's not that I think he is a horrible character. It's just, well... WHY is he here? 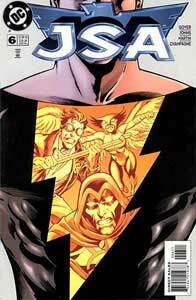 In issue 6, Black Adam attacks the JSA. Why? ... I have no idea. He has no history with them. And I get that it's because of a brain tumor that allows his evil half(long story) to take control of his actions, but if I were an evil Captain Marvel villain, and I had just returned from deep space, then I would go and beat the snort out of the big red cheese. But hey, that's just me! And how DID Black Adam come back from his exile in deep space? (for the record; the exile was of own choice) Did he fly back to Earth? Even with the swiftness of Heru, that's one heck of a trip! And I don't exactly have a problem with him being on the JSA(question is; why not the JLA? ), but how the other members treats him. I get that they dont trust him, since he was once a villain, but the guy proved himself over and over again, and they STILL turn on him on the drop of a hat! What is this, the Marvel U? In fact, I will go so far and say that the other JSA members are bullying him! They constantly tell him that he is not really one of them, and are pretty much just WAITING for him to turn bad. Even Captain Marvel, despite Adam proved himself to be a man of honor in Hades(in Power Of Shazam issue 47). No wonder he left the team. Problem number 2: JSA VS Extant. Extant is the hero Hawk turned mad. He has the power to manipulate time, and during the event known as Zero Hour, it took every team the DCU had to stop him. And even then, he still managed to escape. 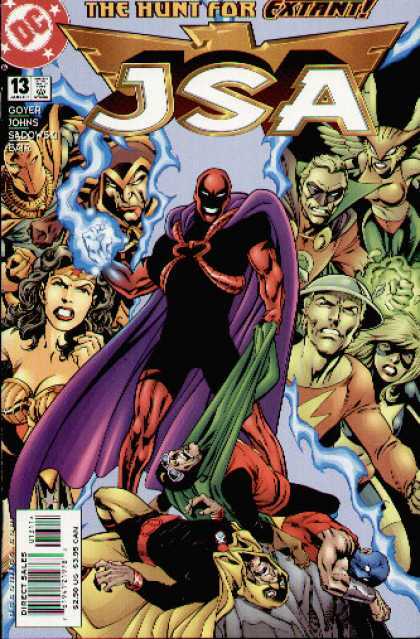 Of all the teams, the JSA was hit the hardest, since Extant aged them and even KILLED the Atom, Dr. Mid-Nite and Hourman. ... And the JSA sends SEVEN of their members to deal with him? No wonder they almost got killed! And YES, I know that they send their big guns(Green Lantern, Hourman and Doctor Fate), and I have to say: Never has Queen Hippolyta been more awesome! But still... seven guys to a universal thread? What's next, the Teen Titans VS Superboy Prime? ... Wait, that actually happened? This one is a little weird, since PeeGee is my favorite superhero of all time(or is it Connor Hawke?). Heck, her solo-book was what really got me into comics! But the thing is... Power Girl is kind of a jerk in JSA. And YES, the fact that she doesn't take crap from anyone is one of the things that makes her so awesome, but there is a difference between not taking crap and... being a jerk as a choice. She starts off with; "If I was Power-Man, if I was stubborn, headstrong and brash, if I didn't take to authority well, no one would think anything of it." Yep, just ask Green Arrow, Guy Gardner, Booster Gold, Batman, Plastic Man and ten other MALE heroes. NO ONE has a problem with them! She goes on with; "Do I worry about what others think? Sometimes. But am I going to hold back and follow their lead? Play sidekick and girlfriend? Hell no! Always show them what you got!" ... So, according to Power Girl, it's okay to be a jerk if you are a woman, since you will be considered independent? But we should still be peeved over Guy Gardner's behavior? 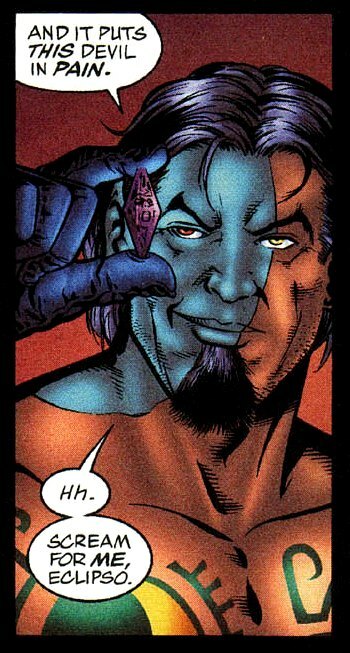 In the "Princes of Darkness" story-line, Alex Montes(The JSA museums curator and the second Wildcat's cousin) helps save the world by making his body into a prison for Eclipso(the evil spirit of wrath). And HOW does the JSA thank him for his bravery and will to defeat one of their greatest foes? Why, they stab him in the back, fire him from his post as curator and decides to NOT trust him anymore, of coarse! I mean, he just SAVED humanity from Eclipso and was one of the major reasons to why they won the war against Mordru! Seriously, why give a guy a break for saving the planet from everlasting darkness? That would just be stupid! I'm not saying that he should be allowed to keep Eclipso inside his body. Sure, his intentions are noble enough, but having an god-like evil spirit is eventually going to backfire(and it did)! But instead of just making him go and join Black Adam's team, there should have been some more build-up. The JSA should have talked with him and tried to tell him that it was a bad idea, and that they should get Eclipso the hell out of him. And that's it. Only four problems with a series is actually pretty impressive, when you think about it. Next time, we will take a look at a four-issue mini-series about everyone's favorite green freak.